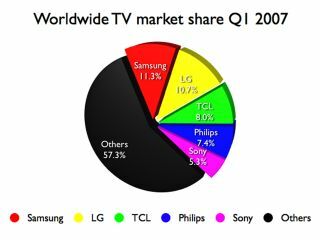 Huge demand for flat panel and - yes - cathode ray tube TVs has ensured that Samsung has held on to its title as the world's biggest TV maker. The Korean electronics giant managed to score 11.3 per cent of the TV market in the first quarter of this year. This puts it ahead of LG at 10.7 per cent, TCL Corp at 8.0 per cent, Philips at 7.4 per cent and Sony at 5.3 per cent. "Global television unit shipments rose by 7 per cent in the first quarter of 2007 over the first quarter of 2006, registering 45.9 million units. While this was a decline from the typically strong fourth-quarter shipments, LCD and plasma display Panel (PDP) televisions enjoyed positive growth with a 90 per cent increase and a 41 per cent increase respectively compared to a year earlier." Demand has been strong thanks to keen pricing on LCD TVs which is now making them as cheap to buy as CRTs. However CRTs are continuing to sell strongly to Third World countries, iSuppli says. The rise of digital TV is also fuelling demand as is the small form factor of some LCD TVs, enabling us to find more places in our homes to put them. iSuppli says that new TV technologies like OLED, LCoS and laser TV will help address quality and longevity concerns among TV buyers. However it also expects LCD TVs to dominate for the foreseeable future.